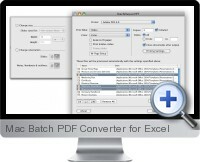 Mac Batch PDF Converter for Excel can convert to PDF or print single or multiple documents from Excel 2008 for Macintosh. Split documents into single page PDF files automatically. Compose variable file names based on page number, user name, current date and other variables. Choose output folder and store them in Favorites for instant access. Reduce PDF size dramatically and optimize PDF for various purposes such as web, print and on-screen viewing using precise controls. Versatile Quartz filters can also be applied to change PDF color tone, brightness and other qualities.